When should newspapers break exclusive stories online? How does a newspaper define an Exclusive? Is it a story it has to itself; a story it publishes before anyone else, or – on occasions – a story the publisher is sole owner of because, frankly, no other media outlet cares? I was involved in some fairly lengthy discussions this week which, essentially, revolved around what was an Exclusive. And during a break I indulged in the Web 2.0 equivalent of askin’ the Magic 8 Ball; I called on Twitter. 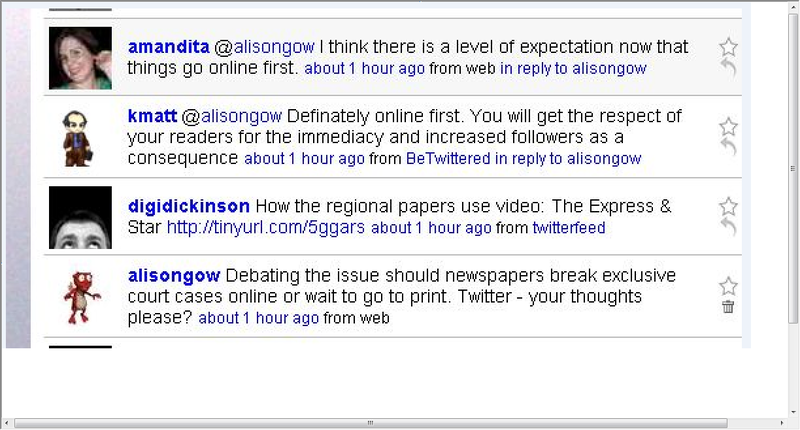 The tweet read: Debating the issue should newspapers break exclusive court cases online or wait to go to print. Twitter – your thoughts please? “How can a court case be exclusive? It’s a public hearing” was another point raised. Now, Patrick Smith from Press Gazette has considered the ‘contemporaneous court reporting online’ issue in an excellent post here. I want to consider when papers should break stories online first – starting with the problems inherent in that phrase when papers should break stories online first. For me, the continuing distinction between a newspaper’s print and online products is just another extension of the ‘journalist as gatekeeper’ debate – when do we decide to share things with our readers and when do we let them have (some) information? This, I think, is the reason the US citizen journalist blogger industry is so strong – they get the information, push it out there and collaborate with their readers who interact through comments; through social networks blog news posts can take on a life of their own. At the most basic level, when I posted a tweet about a serious road accident near my home on Tuesday night, I was depriving my newspaper of an exclusive. But that’s social media – people who witness incidents now don’t automatically tell their local paper; they update their blog, their status, share links, photos or videos online – this is what we are up against and what we have to be able to compete with. This is also a phenomenon that is only going to grow. Exclusive is an empty word unless you can prove that no other person knows about the story – that it hasn’t been shared on a forum, Twitter, a MySpace page, a niche blog. The question is, do readers prize exclusives more than they prize information? Would being a part of the conversation – through comments, related links or perhaps tracing the geographical development of a story via a map – be more valuable to them than the fact no other news outlet had that particular tale? If the answer is yes, then where does that leave the printed page? Well, for me it leaves us with a choice: We can break the exclusive any way we can – get our multimedia brands associated with being first and best for pushing the story out there; Or we can hang on, keep promoting our print exclusives, and try to protect the print product for as long as possible. These aren’t easy choices – these just don’t exist in the changing world of Newspaper Journalism. But the fact is that ‘Exclusive’ on a splash page won’t halt the decline of our print readership. ‘Exclusive’ has been a word much loved by newspapers for decades but, funnily enough, it means far more to us than our readers. It’s our badge of honour – our little dig at the competition. If we insist on holding back our exclusives, we may just be digging our own grave. Alison,Thanks for the linkage.I think when the Post, Echo or any other paper has a genuinely exclusive story, the readers can tell. You almost don’t need to tell them.A good investigation, a clever FOI request, a leaked document or a strong human interest story – all these things are exclusive because the reporter has put the work in or made the right contacts to get information that nobody else has.That age-old competition to get more exclusives than your rivals still matters, even though there is less chance for reporters to find them.As for when the exclusive court report should go up, I don’t see how it harms your print product to go the whole hog as soon as you can. Or to report it in stages online – a banner or flash update with the verdict and ‘more follows’ as soon as it’s over for example.What I’d like to see is the law changed so that your guys can actually film in court, as in America, something that various press groups are already lobbying Government on. Very true Patrick, readers know (and know when they’re being sold short).Interesting point about the courts – filming would be a major step forward (those artist impressions are ridiculous).I believe that the next step could be live blogging court cases from the press bench; how much less intrusive than slipping out to keep phoning the desk! Courts will have to adapt to cope with new technology; wifi and connectivity are, sadly, the least of the problem though – cultural changes will be the big delay I think. We are, after all, talking about the British Judicial System here. Making < HREF="http://www.gameim.com/product/Kal_online_Geons.html/" REL="nofollow">kal geons<> is the old question : Honestly there is no fast way to make lots of < HREF="http://www.gameim.com/product/Kal_online_Geons.html/" REL="nofollow">kal gold<> . Sadly enough a lot of the people that all of a sudden come to with millions of < HREF="http://www.gameim.com/product/Kal_online_Geons.html/" REL="nofollow">kal online geons<> almost overnight probably duped . Although there are a lot of ways to make lots of < HREF="http://www.gameim.com/product/Kal_online_Geons.html/" REL="nofollow">kal online gold<>here I will tell you all of the ways that I know and what I do to make < HREF="http://www.gameim.com/product/Kal_online_Geons.html/" REL="nofollow">kalonline Geons<>.